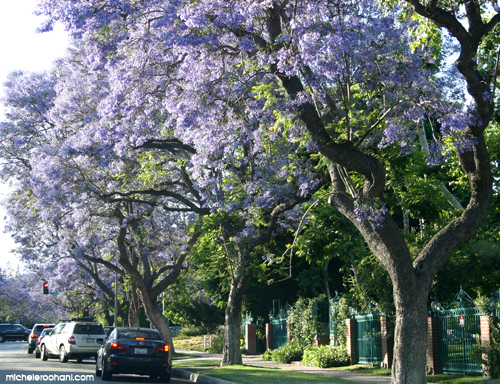 It rains purple in Los Angeles every May. 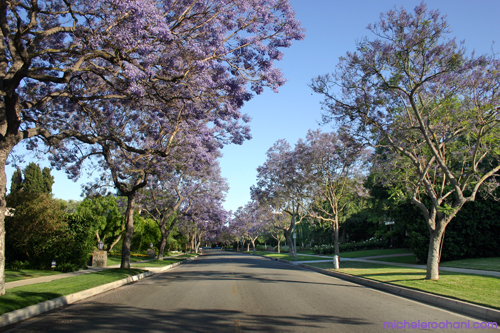 Beautiful Jacarandas in full bloom line some streets in Los Angeles and Buenos Aires. 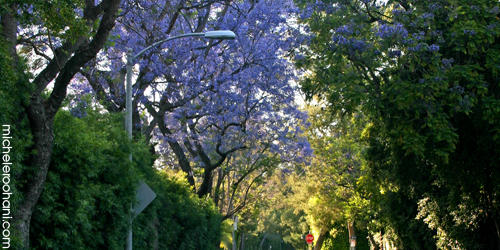 The streets are quiet on sunday afternoons so I went out to take some pictures of the Jacarandas in full bloom. 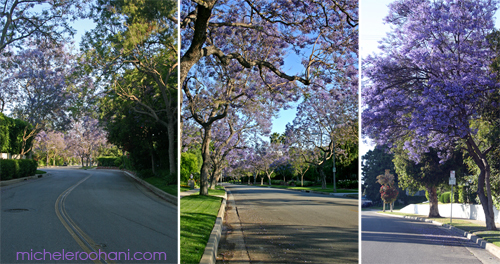 In some streets (like Whittier in Beverly Hills), they line both sides of the road and their branches meet making a beautiful violet tunnel. Their deep lavender color is breathtaking to look at. Do you think he would want to march on Iran like McCain and Clinton promised to do? with these shoes? 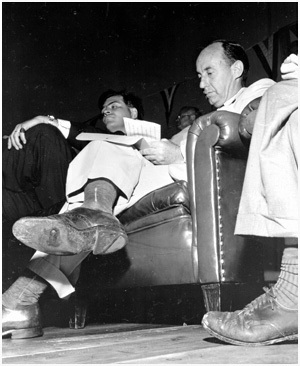 Thanks to Evelyn, Ali and Jim’s comments, we know that this is not the first time that we are seeing the soles of a presidential candidate. 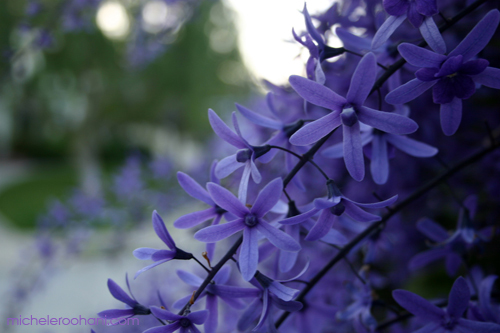 This entry was posted in nature, photography and tagged jacaranda, los angeles in May, obama's tattered soles, purple rain, trees by Michele. Bookmark the permalink. Wonderful botanical survey, and the colours are truly impressive. Thank you for sharing! It’s a great tip, too! I know about a huge Bougainvillea tree near my flat, I’ll go and look to see whether it is blooming already. Its scent is enthralling! 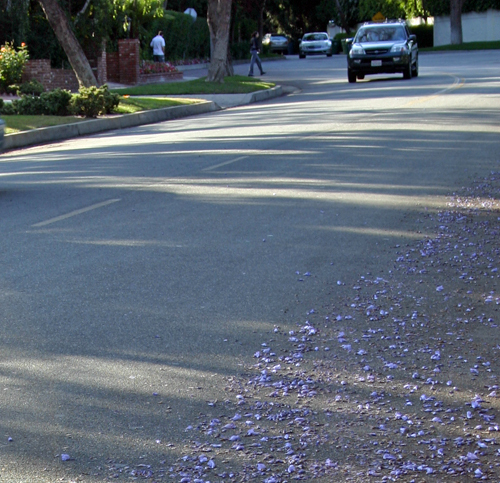 Beautiful springtime flowers and nary a car in sight. Wouldn’t it be great if carless LA became more of a reality? If only the cheap new wifi equiped buses that are appearing on the East Coast were adopted by Angelenos. Beating $4 gas with a $1 bus. There is a hole in politics anyways. As opposed to a flower, what politic appears to be is not what it really is. So stay away from politics dear and stick to your flowers, in this case the real jacarandas. You remember that song ?? Oh well.. I misplaced some words…but I think that Mr OBAMA could sing that too. something that will always be for eternity.. Thanks for sharing the beauty that is around you. I’d love to see it for good, pick up some seeds, and try to grow them in my garden…. Yes, with those shoes it is highly likely that he would march to Iran, if not for anything else, just to buy a pair of unauthentic designer shoes. If a busy person like you can take time out to wander the streets to capture intoxicating beauty surrounding us, I certainly can take a bit of time out to share the fruits with many of my friends. Thank you for making our lives richer and more fragrant as always. The purple rain you refer to is a harbinger of my birthday month. 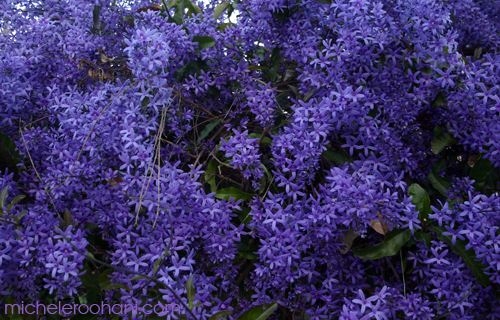 The purple tunnels, or purple carpets everywhere….. This is my time of the year, having been born on May 28, as the jacarandas begin to bloom, the excitement of the passing of the seasons overtakes me and I float on the purpleness of the haze of something exciting in the air…..
Who can talk about purple rain without remembering Prince’s all time best record. “I want to see you laughing in purple rain…. purple rain… ” I have no idea what Prince was on when he put together that album and the movie… but that boy sure likes purple!!! I do wonder, however, if I’d be laughing if I’m in the middle of some purple rain; knowing myself, I’d probably be wondering: “What the heck is wrong with this rain? !” but that’s why Prince is Prince and I’m just a mere mortal! Thanks for sharing this unique feature of Jacarandas. I had no idea about them until this post. Most blossoms just look pretty to me. I am illiterate in botanical taxonomy. Living in the concrete and steel city, I had almost forgotten what it’s like to park one’s car under a green tree until yesterday, when after a visit to a friend who lives in the suburbs, I returned to my car covered under a carpet of green pollen. It looked like the car in the movie Dumb and Dumber!!! Thanks for sharing this other side of Los Angeles. it’s always a pleasure to hear Prince…. I did not remember that song ….. aaah ! We have had an Obama sign on our front lawn since the primary which was in the early spring. We were alone but I now see a few more going up around town. The picture reminded me of another candidate Adelaide Stevenson who I recall ran against Eisenhower. There is a famous picture of him with a hole in his shoe. Great picture of our next president!! 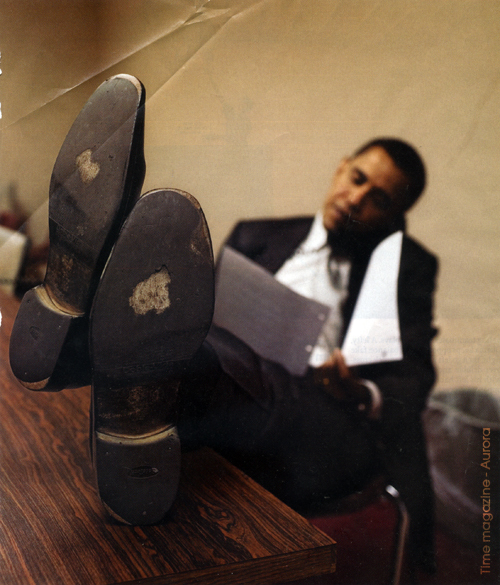 The hole in Obama’s shoe is not a novel picture by the photographer who took it. It’s a repeat of a famous black and white Times picture of Nixon in the White House. It’s dated back in the late 60’s during a cabinet meeting or something. He has similar holes in his shoes, except that his holes go all the way to his socks! (if my memory serves me). The picture won some award… I guess there’s something about a hard working politician who puts the public’s interest ahead of his grooming that resonates with the masses. Ironically, it was Nixon who had to be that politician. Somehow, we think that these folks are hitting the pavement for us and therefore, it gives us a sense of relief to know that they’re working hard. Sometimes I wonder if a good political strategy would be to accessorize from the Salvation Army store. Hey, who knows, the Armani jackets didn’t do Romni any good; maybe he should have tried a hobo line. Ali, as usual your last comment was higly entertaining and thought provoking. But I couldn’t help doing a little fact checking… Evelyn got it right on this one. It was Adlai Stevenson, not Nixon. I like the new version a lot better. I don’t think Obama will fall into the same trap of looking down on the common people. Although we did get a whiff of that with his remarks on “guns or religion or antipathy to people who aren’t like them”. Ooopse! Correction. I mentioned Nixon by mistake. It was Adelaide Stevenson as mentioned by Evelyn! Philippe, if Kantiens and idealists are to be dismissed, who will push us to aspire for that which is better than our practical means? Cynicism leads to apathy and that helps no one but those who make us settle for less than we deserve. It’s not intellectual to ask for change, it’s only the human condition. Le bonheur de se promener le long de ces avenues, jalonnée de jacaranda, qui forment comme une voûte presque transparente d’un délicat ton mauve. Il s’en dégage une sorte de sensation magique qui caresse l’âme et apaise l’esprit. Merci Michèle pour ces photos, que ton talent parvient a illustrer toute l’intensité du charme sensuel que ces arbres dispensent. Gorgeous Colors & Pictures . Thanks for sharing such beauty..
Phillip, I agree that idealism is not really a workable political philosophy and I don’t think it’s the best solution all the time. But every now and then, when we’re beaten up by our own cynicism and our old politics, there comes a time for a refreshing dose of idealism. And in those times, idealists remind us of our ideals and urge us live up to them. Historically, it’s through such idealism that paradigm shifts in thinking have occurred. If Lincoln was a practical guy, he would have accepted the Southern states’ practice of slavery to preserve the union. And this is why when Obama says: “We are who we have been waiting for” he is right. I’m not an idealist myself but I do believe that extreme situations require extreme measures. It’s time for an idealist to heal the damage done by 8 years of bull headed, misanthropic pragmatism. Of course, I wouldn’t want to be Obama in January! Short of pulling a rabbit out of a hat, I don’t know what he can do to redirect the inevitable tides of history. Talk is cheap. We’ll have to wait before measuring up his leadership how he translates rhetoric into action. A smart idealist who has a track record of getting things done, would be so much better than what we have right now; which I won’t even try to describe. Aside from ending the war in Iraq Obama’s agenda emphasizes domestic issues. America should stop rampaging around the world like a bull in a china shop; for the world and it’s own good. Just another in the long list of imports that mess w/ the native landscape. 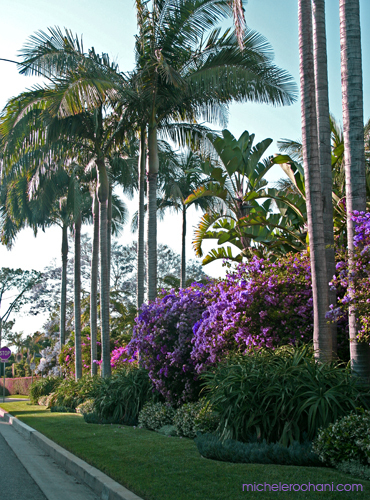 Glad you like it but where does it belong.”Jacaranda can be found throughout most of southern California, where they were imported by the horticulturalist Kate Sessions”. Thanks Kate and who do we thank for: Eucs, Tree of Heaven, Chestnut Blight, Starlings, Dutch elm disease, and Emerald Ash Bore ad infinitum need I say more. I’m sure Jacaranda is beautiful but it’s like transplanting tigers to the Jersey Pine barrens. A little foresight might be advantageous, not just aesthetics and dollar signs.